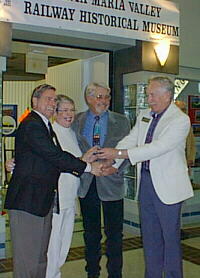 The Chamber of Commerce held a ribbon cutting ceremony at the Santa Maria Valley Railway Historical Museum (SMVRHM) on December 21, 2001 at 4:30pm. The Museum is located across from Robinson-May on the second floor of the Santa Maria Town Center Mall. Pictured at left, officials of the SMVRHM (left to right): Dan Alves, Ginnie Sterling, and Phil Goble accept the now cut-and-rolled-up ribbon from Chamber representative Jim Colegrove. One of the attendees at today's ceremony was Wally Peters (pictured at right with the railroad cap), a 41.5 year veteran of the Southern Pacific Railroad. Wally's proud to say that he's been a member of the Brotherhood of Locomotive Engineers (BofLE) for 59 years - and there's a pin on his cap to prove it! He retired from the SPRR on January 15, 1975. 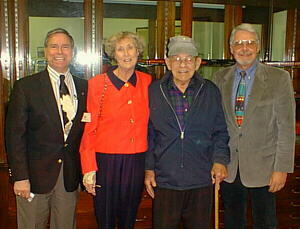 Pictured with Wally are (left to right): Dan Alves, Ann Openshaw, [Wally], and Phil Goble. Wally began his railroading career as a roundhouse laborer in Colton, CA. He became a fireman in August of 1936, and finally engineer in February 1942. He finished up his career in the Los Angeles area engineering locals up to 150 cars with twin diesels to and from the harbor, and running a switcher. For about one month in 1938, Wally worked for the Santa Maria Valley Railroad. Among other things, he recalls washing the boiler on No. 21, and taking it out for a spin!